I've been collecting G3 for at least five years now with the main love of Pinkie Pie in mind. That love has then been brought forward to the newest Generation of ponies. 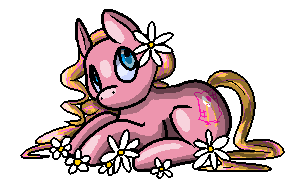 I am mainly a G3 collector and a Pinkie Pie collector. Greetings and hello's! I am Michelle Lysyk from Calgary, Canada! Pinkie Pie..excellent! Enjoy the forum! Hello and welcome to the forum! I hope you have fun in here . Nice to meet you. I can totally get someone collecting G 3 Pinkie. There are a lot of versions of her! I do that with Fluttershy and Rarity. It's fairly large haha but thank you! Ha! I understand completely. I bought two G4s Pinkies from a gal just the other day because she said she was going to Goodwill them and I felt sorry for them. We are a community of thrifters and soft hearts. So many of us buy just because we think the pony needs us as much as we buy for collecting. Thank you! And it's so true. Let me just take you home, bath you and make some room on my shelf. Welcome to the Trading Post! I'm Alyx from Missouri, USA! Hello and welcome to the TP!